Aaron Lynn, 2017 class champion has provided the following guide for tuning the Inland 20.Mast: Mast rake: 28’ 4”. Check by attaching tape measure to main halyard shackle. Pull up halyard to full hoist position and lock in. Extend tape measure to intersection of deck and hull at the transom. This check needs to be conducted with the headstay in the sailing configuration. If using a jib with the wire in the luff, the jib needs to be hoisted and locked into the appropriate position. Note: many earlier tuning suggest raking the mast back in heavy air. I experimented with this and found it is faster to keep the rake at 28’ 4” in all conditions. Spreaders: In line with shrouds. The spreaders should be set up so the tips are in line with the shrouds when the rig is tensioned. Shroud tension: 200-300 lbs. Set the shroud tension at 200-300 lbs. when no loads are applied to the sails. I have sailed with much looser rigs and didn’t notice much difference in speed but the rig will pump and move around in waves and light air. 300 lbs. is not enough tension to prevent the leeward shroud from going slack when hard on the wind, but it is enough to prevent pumping in most conditions. Upwind Sailing: Light air (0-6 MPH): In light air, you need to apply backstay to shape the main sail properly. The mains are cut for a certain amount of mast bend. In light air, the sheet tension is not enough to bend the mast so you need to bend it with the backstay. The main traveler needs to be pulled up to windward to induce twist in the sail. Vang is off, main downhaul is off. Jib traveler 2-3 inches above the board slot. Jib downhaul light. In light air there will usually be higher wind velocity at the top of the mast than at the bottom of the sails. Sometimes, there is no wind at all at the water surface (indicated by smooth water without ripples) but there is still wind farther up. 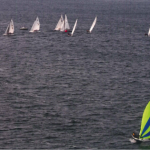 This condition requires a great deal of twist in the sails for maximum speed. Travelers up, backstay on and soft-sheeting produce twist. Watch the leach telltales on the sails. They should be streaming aft most of the time. If the upper leach telltale is stalling, more twist is required – sheet out. If the upper leach telltale streams aft but the lower leach tell stalls, less twist is required. Drop the traveler or sheet harder. In light air it is important to keep the boat heeled to reduce waterline. Light air is when the most heel is desired. Move crew weight gently so as not to rock the boat. The apparent angle of the wind will vary greatly with velocity changes. When a gust first hits, sheet out to compensate for the apparent wind going to the side. Slowly sheet back in and head up as the boat accelerates. Try to keep the boat moving, even if you feel headed. Once the boat stops, it’s very hard to get going again. 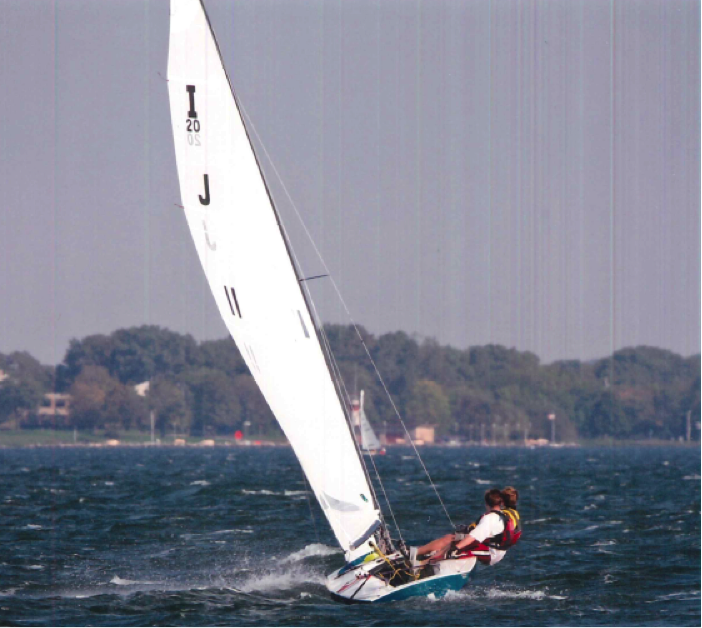 Medium air (7-14 MPH): Medium air is boat speed and gear changing conditions. At the lower end of the range the traveler should be up and main sheet tension moderate. Vang and main downhaul off, jib downhaul light. Sheet the sails so the leach tell tails stream aft about half the time. Jib traveler in line with the board box. As the wind builds, apply more vang and main downhaul. Sheet the main and hike to maintain boat heel so the leeward rail just stays above the waterline. Keep the traveler up so the boom stays on center. I20s will point higher this way. Heavy air (15 MPH+): In heavy air the controls will be pulled on hard. Firm to very hard vang, main downhaul to pull out the wrinkles along the luff of the main. Jib downhaul on firm to hard. Backstay on firm to hard as required to control the boat. I try to keep the traveler up and the boom on center until the very upper limit of wind velocity. When dropping the main traveler becomes necessary, drop the jib travelers as well to avoid choking off the slot between the main and the jib. In heavy air the goal is to create maximum forward thrust with minimum drag. The sails should be flat (low camber) and the slot should be open. The mainsheet will constantly be going in and out to maintain constant heel without the deck going into the water. Hike hard at all times. Survival Conditions: In survival conditions where you’re just trying to finish the race or make it to shore, it is beneficial to pull the board up halfway. You will be able to sheet in father without excessive heel. Main and jib travelers can be let way down. Be ready to sheet out in the big gusts but sheet back in enough when you can to keep the boat moving fast. The boat will be more controllable and responsive at speed. Light air (0-6 MPH): In light air, concentrate on getting the boat moving first, then work on angle. Board should be full down or only slightly raised. Set the board depth to balance the helm. Let jib traveler all the way down. Crew weight should be forward and on the low side. Induce maximum heel. 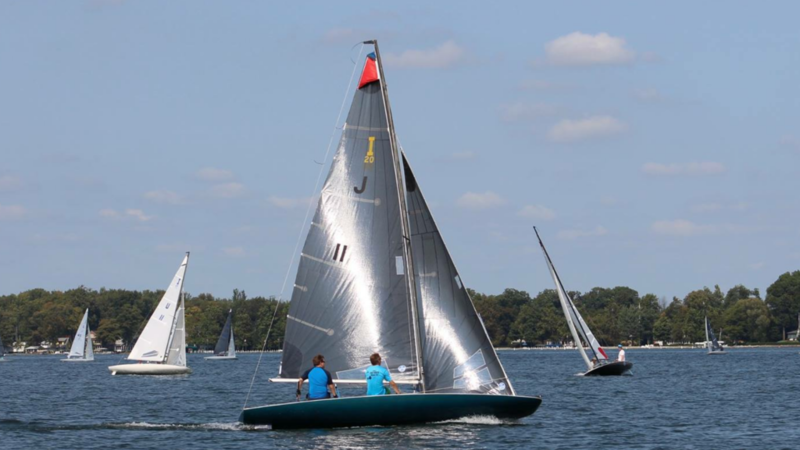 Medium air (7-14 MPH): Medium air downwind provides options. You can opt for lower and slower or higher and faster. Generally the skipper should sit on the low side. The crew can be either low or high depending on wind strength and desired angle. Crew weight lower allows the boat to be driven deeper downwind. Always maintain heel. Flat heel angle is slow. The board should be ¾ to ½ down. Set the combination of board depth and mainsheet such that the boat has neutral helm. Vang off, backstay off, jib traveler all the way down. The skipper should always to looking in the direction the apparent wind is coming from and comparing that to the wind coming from behind to determine if a jibe is necessary to catch a gust. Heavy air (15 MPH+): This is when it gets fun. Set the board about ½ down. In heavy air, get the boat up to speed and sail fast. The apparent wind will build and the velocity will pull your angle down. Vang off, backstay on slightly to keep mast from flexing forward, jib traveler all the way down. Crew will be on high side. Skipper on high side and hiking in gusts, can be on low side in lulls. Work the sails for speed. Get the boat planning and keep the boat going fast. Capsizes tend to happen when going slow.